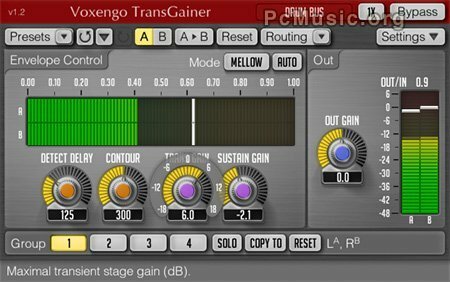 An updated version 1.2 of Voxengo TransGainer is now available for download. - A problem with the Global Settings sliders missing fixed. - Side-chain routing presets now appear dimmed to reduce confusion. in some hosts (i.e. Tracktion). - Preset "update" function implemented in the preset manager. - "Density mode" implemented in level meters. fixes incompatibility with some non-VST2.3 compliant VST hosts. - The "Show All Channel Meters" routing switch added. - Additional visual look variation settings added.